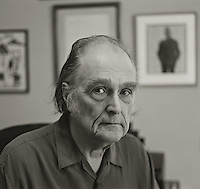 Poet Clark Coolidge was born on February 26, 1939 in Providence, Rhode Island. As a young he attended Classical High school, with four years of Latin before attending Brown University, where his father was a professor in the music department. Coolidge majored in Geology. In 1958 he hitch-hiked to Los Angeles, reading Jack Kerouac and Thomaas Wolfe. Later that year and into the next, he lived in the Village (on Horatio Street) and began writing. The next year the young poet returned to Providence, performing as jazz drummer with Buell Niedlinger. He also met-poet publisher Jonathan Williams, with whom he shared an interest in the writer H. P. Lovecraft. In 1962 he married Toni Carbo, who worked at the Brown University Library. Coolidge also began experimenting with cut-ups and chance generated poems. The next summer he attended a summer poetry seminar at the University of British Columbia in Vancouver, meeting Charles Olson, Allen Ginsberg, Robert Duncan, and Phillip Whalen. There is also met Michael Paler, with whom, in 1964, he would edit until 1966 Joglars magazine. That same year, he met Louis Zukofsky. The following year he attended a Conference on Little Magazines at the Library of Congress, where he met poet and editor, Aram Saroyan, who later became a close friend. When he marriage broke up in 1966, he moved to New York again, living near Saroyan who published, on his Lines Books, Coolidge’s first publication, Flag Flutter & U.S. Electric. That same year, he moved to Cambridge, Massachusetts, sharing a house with Saroyan. The next April, Coolidge moved to San Francisco, joining David Meltzer’s Serpent Power band. In Decemeber of 1967 he married Susan Hopkins. Their daughter Ceclia Elizabeth was born the following year. He also met Bernadette Mayer and the artist Philip Guston, both of whom would become close friends. During 1969-1970 Coolidge produced a weekly poetry show, WORDS, for KPFA in Berkeley and made word-tapes at Mills College Tape Center. Later that year Coolidge and his wife moved to Hancock, Massachusetts in the Berkshire Hills, where they lived until 1997. Meanwhile, his third book publication, Space, was printed by the prestigious commercial press, Harper that same year. Over the next four decades the poet published dozens of volumes on a regular basis, while editing collections and writing essays on poetry, jazz, and art (on and with Philip Guston). He also traveled extensively to the Galapagos Islands, Egypt, Paris, and, in 1989, along with the Rova Saxophone Quartet, Lyn Hejinian, and Douglas Messerli, to the Soviet Union and the Baltic countries of Lithuania, Latvia, and Estonia. Since there he has read in both Scandinavia and Russia, London, and Berlin. In 1997 Clark and Susan moved to Petaluma, California. The petals are missing this felt dry sky. Crease bunch bricked to the ankles. I write stormings. Visors for fenders. The alkali in the moot tip pending. Slant the tree among its polish. a mackerel and lodged much cheese. the ridge will edge with the mattress molding. Bulk. Day gone room for the end.